Skoda’s first-ever SUV, the Yeti, has been replaced by the new Skoda Karoq and has come to the market at a time when sales of compact SUV’s have never been stronger. 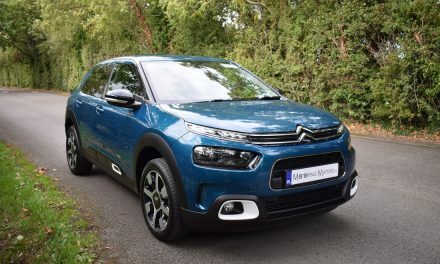 The Karoq has already proven that it is a more than capable contender in the crowded compact SUV market thanks to its clever use of space, good value for money and clean, modern design. 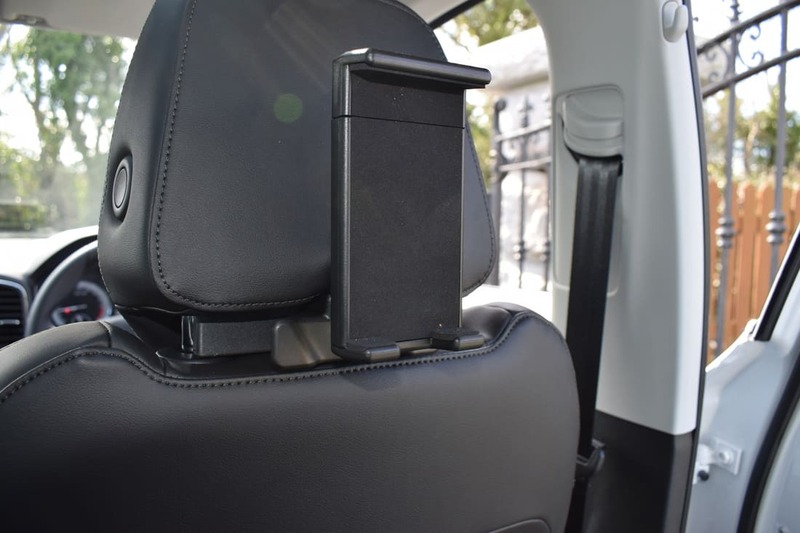 The Karoq is bigger than the Yeti and gets a similar adaptable rear seat arrangement, but it shares more in common with the larger Kodiaq SUV, making it a practical choice for families. 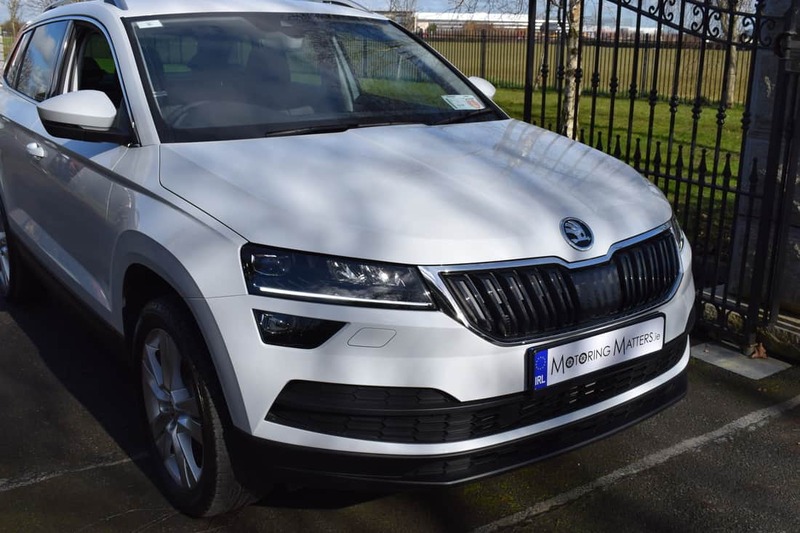 Interestingly, in November 2016, the Skoda Kodiaq was named the ‘Best Family Car in the World” by Top Gear Magazine and it won the title of Car of the Year 2017 in the Czech Republic, Poland and Bulgaria, along with the title of SUV of the Year 2017 in China and France. With the new Skoda Karoq possessing the DNA of the Kodiaq, it is sure to be yet another sales success for the Skoda brand. The Karoq name and its spelling originate from the language of the Alutiiq, an indigenous tribe who live on an island off the southern coast of Alaska. The name KAROQ is a combination of the terms ‘KAA’RAQ’ (car) and ‘RUQ’ (arrow). The Karoq is one of a family of vehicles sharing the VW Group’s latest MQB platform – it’s effectively a sister-model to the SEAT Ateca, and is one of its chief rivals. 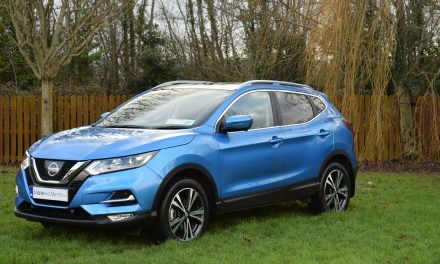 Other competitors include the Peugeot 3008, Ford Kuga, VW Tiguan, Hyundai Tucson, Kia Sportage, Mazda CX-5, Renault Kadjar and the Toyota RAV4. With the new Karoq there is a choice of four engines and two trims levels – Ambition and Style. Petrol power is supplied courtesy of a 1.0TSI with 116bhp or a 1.5TSI with 150bhp. Diesel engines consist of a 1.6TDI with 115bhp or a 2.0TDI with 150bhp. 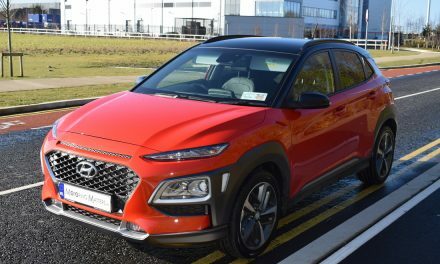 A seven-speed automatic (DSG) gearbox is available as a €2,000 option, but four-wheel-drive is reserved only for the 2.0 TDI – in 6-speed manual or 7-speed DSG guises. My test car was a Karoq Style, 2.0TDI 150bhp DSG 4x4 and was finished in dazzling Moon White metallic paint. While the standard equipment in the entry-level ‘Ambition’ model is impressive, my range-topping ‘Style’ model came with 18” Mytikas alloy wheels, Columbus Satellite Navigation with a 9.2” colour touch screen, DAB radio, SIM card slot, WLAN connectivity, Infotainment Online & Bluetooth, exterior chrome package, park distance control with rear view camera, dual-zone air-conditioning, light & rain assist, KESSY (keyless entry, start and exit system) with push button start, Smartlink with voice activation, LED headlights, interior ambient lighting, hill-hold control, rear privacy glass, front fog lights and front assist. 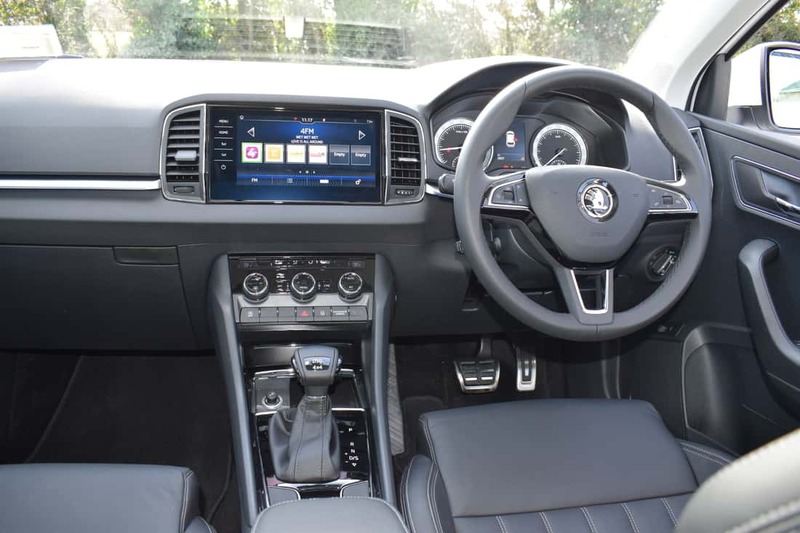 Optional extras fitted to this car included adaptive cruise control, lane assist, light assist, traffic assist, electric tailgate, rear seat tablet holders, panoramic sunroof, leather interior, VARIOFLEX seating, and Skoda’s ‘PhoneBox’ with wireless charger. The new Karoq’s practicality is boosted by massive front door pockets, which can each accommodate a 1.5-litre bottle of refreshments, a removable bin and four handy shopping bag hooks in the boot. These hooks can be easily slid along a plastic bar for to accommodate larger shopping bags if the need arises. The new Karoq provides ‘best-in-class’ boot space, with between 521 and 1,630-litres available depending on the positioning of the rear seats. 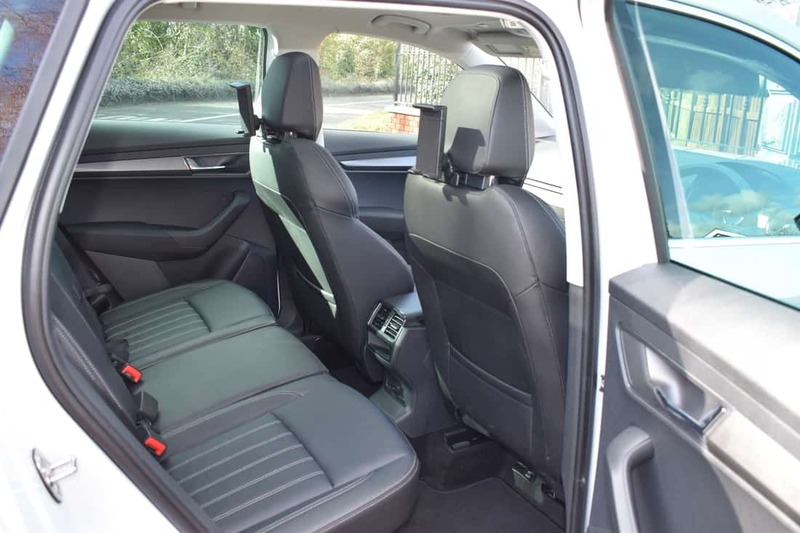 The cabin of the new Karoq will please both the driver and passengers in equal measure with masses of leg and headroom (even with the panoramic sunroof fitted) making it easy to get comfortable for the journey ahead. A raised driving position combined with thin windscreen pillars and big side windows means visibility out the front or side is good. 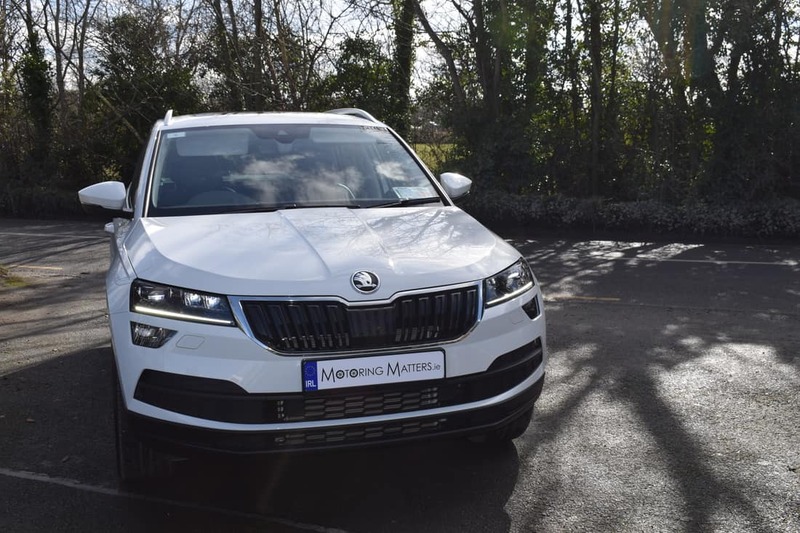 Skoda’s interior design team were tasked with the brief of ensuring that the Karoq has a distinct Skoda identity, and came up with an interior that feels right up-to-date, while a few metal and piano-black trims add a touch of class. Drivers will be impressed by the logical layout of the buttons and switches, as well as the ultra-clear instruments. On the road, the Karoq feels agile and sporty, while the steering has a natural-weighted feel to it allowing the driver to swoop from corner to corner with confidence-inspiring accuracy. 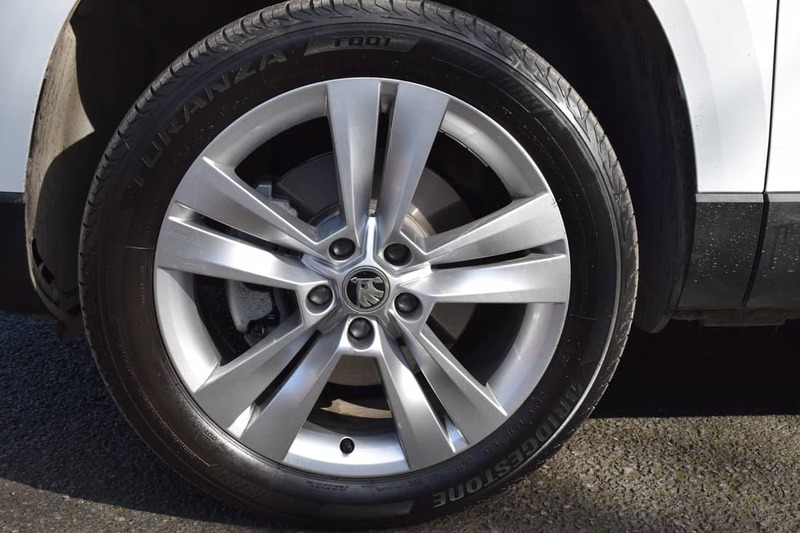 My test car provided efficient and refined performance, while the excellent chassis produced a good mix of comfort and driving pleasure. 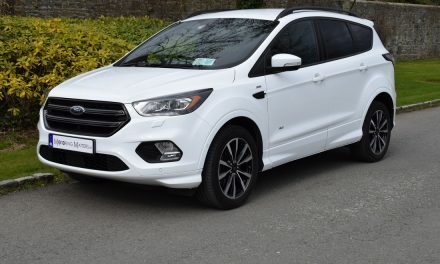 With power ranging from 115bhp to 150bhp across the Karoq engine range, none of the petrol or diesel engines will disappoint even the most demanding of compact SUV drivers. 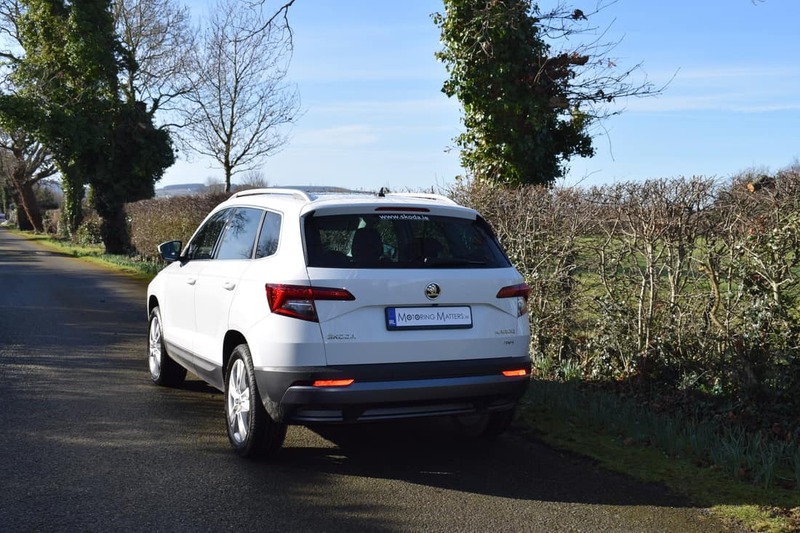 Across the Karoq range, you can expect to achieve fuel consumption figures from 4.3l/100km to 5.5l/100km on an extra-urban driving cycle, while annual road tax ranges between €200 and €280 depending on the model chosen. 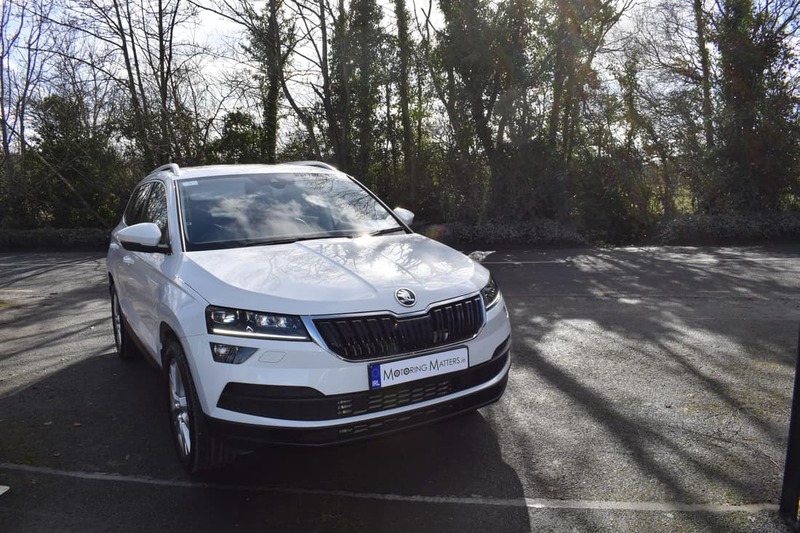 With ex-works prices starting at just €27,715 it is easy to see why Skoda refer to the new Karoq compact SUV as ‘The Compact with Impact’.